When America's wealthiest and most influential media star calls it quits on her talk show, it's great fodder for several news cycles. But two years will pass between Oprah Winfrey's announcement last Thursday and the September 2011 air-date of her final syndicated show. And that gives the publishing industry plenty of time to fret about life after its most important tastemaker leaves daytime broadcast TV. "There's no question that when it comes to books, she has been the premier influencer of our era," says a publicist at Simon & Schuster, which benefited greatly when Winfrey featured Rhonda Byrne's self-help smash The Secret on The Oprah Winfrey Show in 2007. 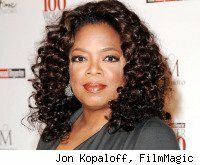 Even Jonathan Franzen, who famously rejected Oprah's selection of his 2001 novel The Corrections, told The Daily Beast he was "sad" about the news: "Oprah's show is the last place on the networks where serious books still sometimes get a hearing, so it's sad to learn of her impending retreat to cable." Is the doom and gloom warranted, or does Oprah's long goodbye have a silver lining for literary lions? Looking at the numbers, Oprah's retirement looks like a huge blow for book publishing. Between 1996 and 2002, almost all of Oprah's Book Club monthly picks of contemporary novels on her show -- generally, midlist titles, like Jacqueline Mitchard's The Deep End of the Ocean and Christina Schwarz's Drowning Ruth -- immediately shot up to No. 1 on the New York Times Bestseller List (and often stayed on top for weeks, or months). An Oprah pick guaranteed minimum sales of half a million copies. When she revived the club after a yearlong hiatus, the newfound focus was on classics. The Oprah Effect then brought decades-old novels by William Faulkner and John Steinbeck back into mass-market consciousness. In 2005, she returned to choosing contemporary novels, and she got her magic touch back. Cormac McCarthy's Pulitzer-winning The Road seemed an unlikely No. 1 bestseller; David Wroblewski's The Story of Edgar Sawtelle, with its riff on Hamlet in rural Wisconsin and emphasis on dogs as heroic figures, seemed a more Oprah-centric choice. Again, the tale was in the sales: Sawtelle, a pre-publication favorite, with a big push from publisher Ecco, debuted on the Times list at No. 14, with an initial print run of 26,000. After Oprah chose it, it skyrocketed to No. 1, and Ecco printed 750,000 additional copies. But by then, Oprah's Book Club had lost its edge. The monthly pace slackened to a handful of titles a year. By 2009, there was just one -- Uwem Akpan's Say You're One of Them, plugged in April. The Book Club's selections had become darker, grimmer books by men, quite removed from the issue-driven books by women that were the norm during the Book Club's heyday. Of course, it's likely the Akpan figures have more to do wiith larger forces at work -- cultural fragmentation, lower book sales overall and declining daytime TV viewership (Oprah's numbers are down to 7 million viewers a day). But if Oprah's literary influence is on the wane, then moving over to her own cable channel with Discovery Communications (DISCA), the Oprah Winfrey Network, won't help matters. Just ask Howard Stern. Consider the case of Richard Madeley and Judy Finnegan, the British TV presenters who launched the Richard & Judy book club, on Britain's Channel Four in 2004. The results astonished and delighted the U.K. book trade, reaping benefits for commercial thrillers, women's fiction and more "difficult" literary titles like David Mitchell's Cloud Atlas. But then R&J moved to satellite TV. The creators anticipated keeping a tenth of the show's Channel Four audience, but far fewer made the switch, and the show was cancelled in May. The R&J book club will be revived in 2010 on Channel Four, but its future effect on book sales remains to be seen. "The lesson from R&J would appear to be that you cannot expect to take your audience with you if you move to a minority channel," says Nicholas Clee, editor of Book Brunch, a leading U.K. publishing industry newsletter. Oprah's tastemaking may never return to the heights of the Book Club's early years, but then, publishing is far removed from its late 1990s peak as well. American TV today represents not convergence but balkanization. Comedy Central has its own book-tastemaking fiefdom -- authors who appear on The Daily Show and The Colbert Report see very brief sales spikes. Politically conservative thriller writers hail Glenn Beck as "the New Oprah." And authors barnstorming the morning shows doesn't give sales the same kick it once did. That means someone could step up with a new book club. My vote for most promising candidate: Craig Ferguson. His Late Late Show already has had a long list of author guests, including Dennis Lehane, Lawrence Block and Michael Connelly. Close to five years after its debut, it won its time slot, beating out Jimmy Fallon and Carson Daly. Ferguson even has a stake in the publishing game -- he's published a novel and a memoir -- and he appeals to women, who are greater book consumers than men. But even if my own Ferguson fantasy came true, the days of one book club's influencing mass reading tastes will come to an inevitable end. That may turn out to be a good thing for publishing, no matter what Oprah decides to do on her own network -- whether something "smaller and different" or a carbon-copy of her daytime talk show. "I don't believe that Winfrey's move from network to cable TV will adversely impact her ability to sway the marketplace -- quite the opposite, actually," says Kathleen Rooney, author of Reading with Oprah: The Book Club That Changed America. "With an entire network, she'll need a lot more content, and it seems likely that part of that content will continue to be literary. We probably won't see the huge runs on single titles like we've gotten used to, but more diffuse coverage of more titles, which is probably healthier for everybody."